Perhaps the same can be said of a touch of glass art. As Bruce Harkey, executive director of the Franklin Park Conservatory, said at a recent luncheon hosted by the Columbus Metropolitan Club, there’s something magical and ancient about glass blowing. Hosted by Ann Fisher of WOSU, Harkey was joined by Columbus Museum of Art executive director, Nannette Maciejunes for a lively conversation on the Chihuly impact on Columbus. 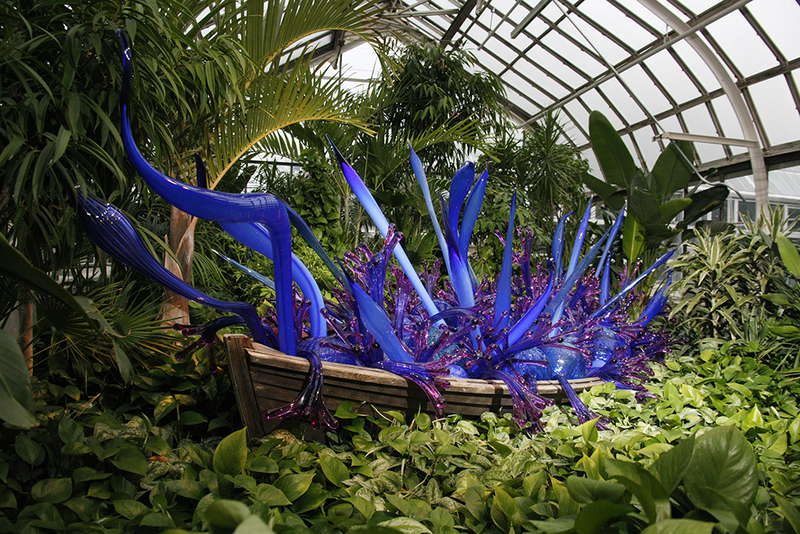 Chihuly’s crew – known as Chihooligans – have been busy this year setting up installations at the CMA, Franklin Park and Hawk Gallery. Having previously covered the exhibit at the museum in our blog, we thought we’d share our visit to the conservatory. Chihuly Reimagined blends glass, plant life, color and light in such a way as to render an experience different from the Chihuly exhibit at the CMA. The greatest example of reimagining the placement of art and nature is seen in the reuse of a massive downed oak tree, which prior to a lightening strike once stood on the northern edge of Franklin Park. Blue Reeds & Marlins changes by the day and time of day. We happened to experience it on an overcast day. Sunny days cast deep shadows across the oak’s trunk, while night time adds the element of lighting by well-known light artist, James Turrell. “Plants are critical to the experience at the Franklin Park Conservatory,” said Maciejunes during the CMC luncheon. 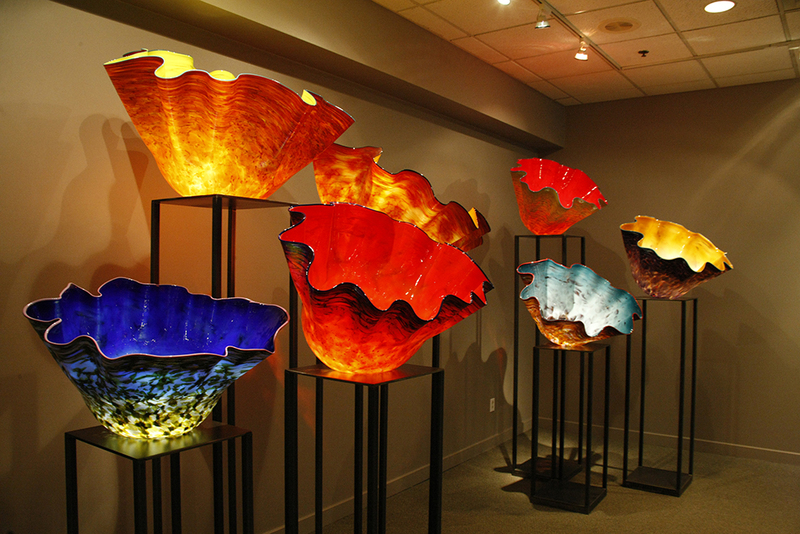 In Macchia Forest, the fluted bowls take on a different feel from those on display in the conservatory’s exhibit room. 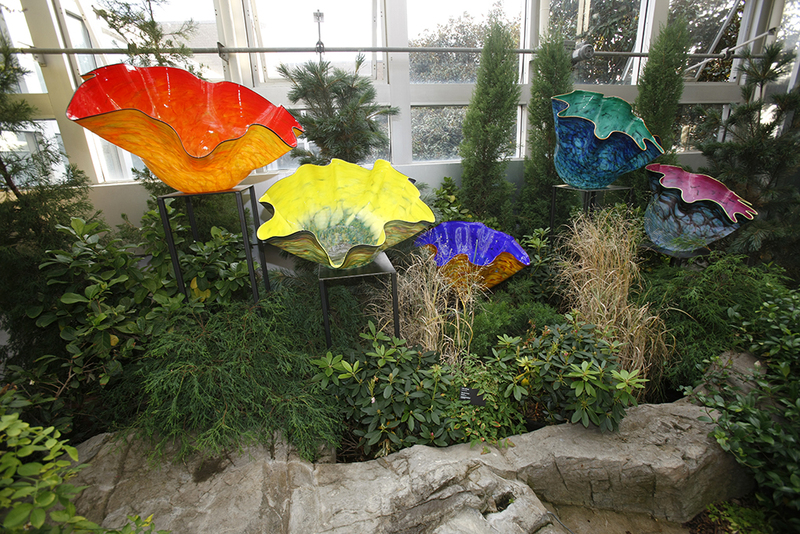 The exhibit continues at the conservatory through March 28, 2010. Live Glass Blowing Demos are held daily in the HotShop from 11-2 on Monday-Friday, from 11-4 on Saturday & Sunday and from 5-8 on Wednesday evenings. 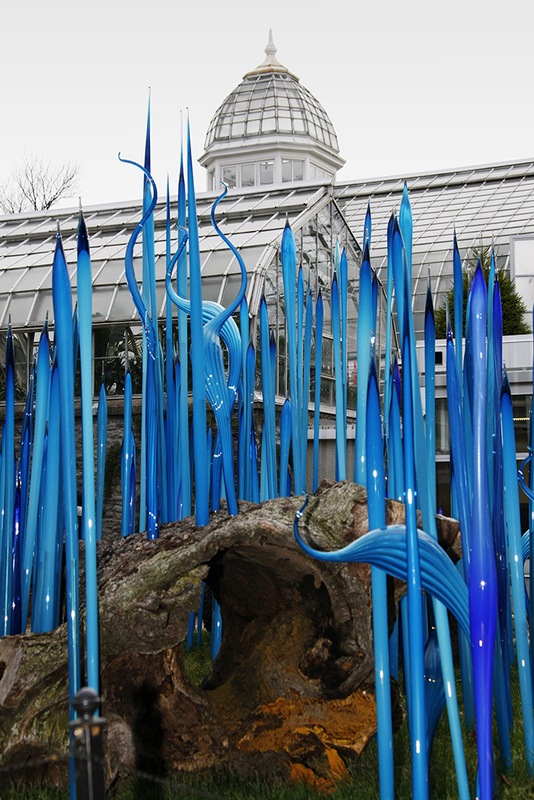 This entry was posted in Art Exhibit Reviews and tagged art review, Chihuly Reimagined, Dale Chihuly, Franklin Park Conservatory, glass art, James Turrell. Bookmark the permalink.